Entering just before the big lunch rush, we were lucky to have waited in line for only fifteen minutes to order. By the time we did, seats opened up and we were able to enjoy our meal sitting down. We decided to go with the classic cochinita pibil with wood-roasted suckling pig with achiote, black beans, pickled onion and habanero, a fresh, made-to-order wood-roasted chicken pozole caldo with Gunthorp chicken, pozole corn, rich broth, crunchy garnishes, ground red chile and lime and the Friday special: The Top Chef torta with braised beef tongue, choritzo, potatoes, avocado and salsa verde. Everything was amazing. The one thing that is worth mentioning about the cochinita pibil, is to watch out for the sauce! It’s very, very hot. We didn’t get a warning but luckily, my food partner doesn’t mind spice at all so the habanero was no big deal. Me on the other hand… Whew! Once I got a taste, it had my lips burning up a real fire for the rest of the meal, almost to the point of unbearable (but that’s just me, more averse to spicy things). 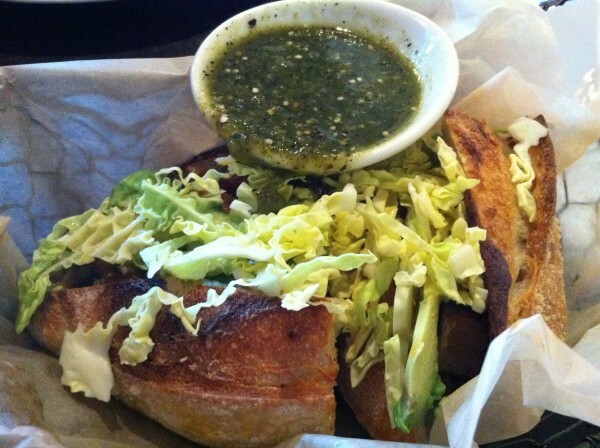 Just be careful about how much you pour on your torta, otherwise perhaps ask for a milder sauce. The caldo soup was great – lots of limey notes, a very flavorful broth and as promised, a bunch of crunchy garnishes. There is a kick of spice that lingers and intensifies towards the bottom of the bowl, building on all the flavors that are already in your mouth and on your palate. The Top Chef torta was crunchy and delicious, with the tongue cut up in little cubes, mixed in with heavier sausage and potatoes and a fresh bit of avo, I wolfed that thing down in minutes. The salsa verde is a nice addition. The cost of a meal here is very reasonable. Most dishes cost from $9 – $12, in the same price range as food court fare except that at XOCO, the dishes are expertly prepared with the freshest ingredients from local farms. If we had anything close to this in my city, I would be there every single day. No joke. Tags: avocado, Beef Tongue, Beer, Black Beans, Caldo, Chicago, Chorizo, Churros, Cochinita Pibil, Frontera Grill, Habanero, Hibiscus, Lemon, Lime, Mexican, Onions, Potatoes, Red Chile, Rick Bayless, Salsa Verde, Soup, Spicy, Suckling Pig, Top Chef, Topolobampo, Torta, Xoco.